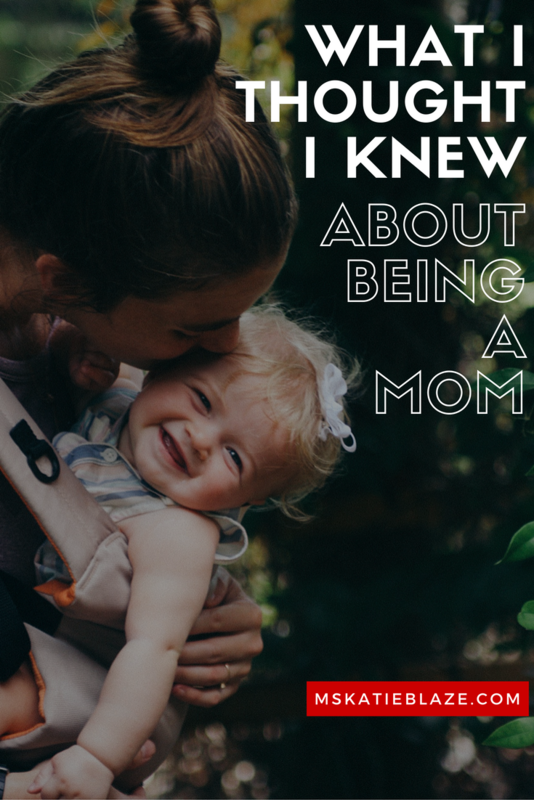 What I thought I knew about motherhood. I thought I knew a lot before I had a baby. I realized the things I was "so sure of", I'm really not so sure of now, and new challenges appear daily. Its the most pressing yet fulfilling time of my life. Here's what I know now: I thought breastfeeding would feel like such a sacrifice. Although I had a goal of doing it for 6 months or maybe longer, I secretly thought I'd probably give up earlier, because it would restrict my freedom and other knowingly selfish reasons. Honestly, I was dreading it a little. I was totally unaware of how powerful hormones were, and never thought I'd enjoy the one-on-one time with E as much as I have. My goal is now to do it for a year. Just me and her. It's amazing. I look forward to coming home to feed her. Its one of my favorite times of the day. I thought getting up at 4:30 am to pump then get my running in would be nearly impossible. I'm not saying its easy, but if you want something bad enough, you just do it. I cant really explain it. I just get up, get it done, and move on. There really isn't time to put it off. Simply put, if I want to run, it's gotta happen at zero dark 30. I thought I'd still be able to have little side projects and time to do things I "somewhat" enjoyed. I say "somewhat", because these are commitments I might have had before the baby arrived. I definitely enjoy them, but they aren't things I'm so so passionate about. For example, submitting articles for a magazine out of Nashville. I've been doing this for 5 years, and now it's all coming to a head and I've had to ask myself, "Can I still do this?" Or maybe it's the handful of people I coach for running. I do it because I enjoy it, not for the money, but do I truly have the time to still do this? This season of life leaves little time for side projects. There just isn't enough time in the day. I'm going to have to very purposefully choose what I want to do or who I want to see during "that one available hour." The things I choose to commit to and the people I choose to surround myself with needs to be very thought out. If it's not thought out, these "fire years" as Sarah Mac describes, will decide for me. These are the fire years. I thought my fitness would take a long time to return. I stopped running at 30 weeks pregnant, but really, I probably stopped at more like 26 weeks, as those last 4 weeks were very minimal running and very uncomfortable. I am totally shocked at how fast it's all coming back. I ran a 5k last weekend and won! What in the world?! This has been the most fun journey, and it's not over. I can't wait to see where it takes me. I thought my non-parent friends wouldn't be interested in hanging out because I have a baby. I'm the first of my group of friends to have a baby, which means a lot of things are different about my life compared to my friends who are either single or newly married without kids. I thought my life would seem so boring and I'd have to make new mom friends. I am making new mom friends, but I never thought all my non-mom friends would be totally obsessed with Emerson. It's hilarious and the best! I love how they've taken her under their wing, offered to baby sit so Jon and I can go out, and just loved on our girl. I didn't expect that. I thought returning to work at 6 weeks postpartum would be so hard. I was completely shocked when my transition back to work went smoothly. I very much expected to have an emotional few weeks or months of missing Emerson, feeling the guilt of being away, etc. I didn't realize how much I loved my job until I was about 5 weeks into maternity leave and I was "ready to go back to work." I love Emerson soo much, but I do think going to work makes me a better mom. I look forward to coming home to see her, and I love our time together, but I love my job, too. I always thought I'd be a stay-at-home mom. This definitely took me by surprise. I never thought my marriage would be stretched the way it has been. I am all about being open and honest, because I feel like if I am vulnerable, maybe it will open other people up, too. Vulnerability help us grow as people. Jon and I have an amazing relationship, but if there's one thing that's stretched us, it's this beautiful bundle of joy named Emerson Ruth. She is a pretty easy child, but I keep going back to sleep deprivation, and we are actually sleeping 7-8 hours a night! Not getting the sleep you need (Jon and I both are heavy sleepers and Jon requires 9-10 hours a night, where I function best at the typical 8. We are high maintenance!) and having another human who requires so much attention, will make you say things you don't mean, and it will make you selfish. It's all such a learning thing. I can't imagine where we would be if we didn't have a strong relationship prior to the baby. It would be bad. With that said, I cannot stress enough, if your relationship is on the rocks or you are having troubles, do NOT think a baby is going to make things better/easier. It will make it harder! We have to be very diligent about putting Emerson down at 7:30pm every night so we can have time together. If we didn't do that, Jon and I would probably never have a chance to catch up and just be together. We need this time. That's a small example. We agreed from the beginning that our marriage comes first, and then the child. Everyone does things differently, but for us, we know a happy baby can only happen if there's a happy marriage, so each day, we say a lot of "I love yous" "I'm sorry" "I'll do better" and "How can I help". It's not always easy, but it's worth it. It is and will always be worth fighting for.